Simply put, digital marketing is any form of marketing that takes place through a digital channel – particularly through the Internet, social networks or mobile apps. Lately, however, it tends to be blurring the lines quite a bit more as digital starts to make inroads to traditional advertising (such as TV, direct mail and even in-store marketing). But for now, we’ll focus on the more “classic” definition of digital marketing. To best understand digital marketing, think of all the devices you access content, information or entertainment (your mobile phone, your connected TV, your computer, your video game consoles, your Amazon Echo, etc). If those ways require using something connected to the Internet, chances are they’re being utilized by digital marketing. Now think of each of the specific ways you’re getting this content. Facebook, Twitter, YouTube, Snapchat, search engines, blogs, web sites, landing pages and dashboards, podcasts, etc. Each of those is a part of digital marketing – because each one is a way to communicate via digital means. And that’s what digital marketing is: communication via digital channels, with a goal to promote or sell a product or service. Basically, if it’s a way to communicate, that method uses some kind of computer to deliver the message and the goal is to sell something, that’s digital marketing. What Are the Channels for Digital Marketing? If the above explanation of digital marketing is a little to broad, there’s a reason for that … and it’s because there are a lot of different ways to go about digital marketing. Here are some of the main digital marketing channels and methods, with a bit of a description of each. When someone is looking for information online, the standard method of finding it is by going to a search engine like Google and typing in what you’re looking for (that’s called a “search term”). Where sites, web pages, videos, images, news stories and more show up in search engines is a complicated business, including a lot of crazy algorithms that are continually being updated and modified. But the basic answer to “what is digital marketing?” when it comes to search engines is this: how do you make your product or service get the most visibility in search engines? – but the general concept of search engine optimization is the idea of making your web pages or other content easy for search engines to find, and then to make those pages more likely to show up when someone searches for a specific term. For example, the goal of this article is to help people get an answer to their question “what is digital marketing?” and as such, I am doing specific things to the page to make it more likely to show up high in search results. 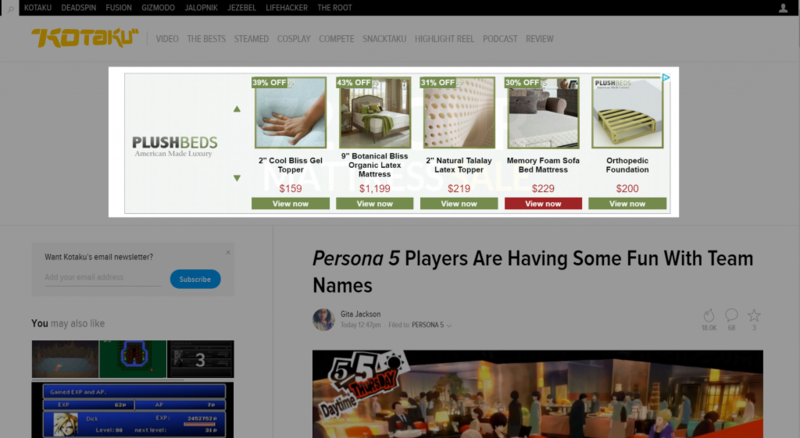 An example of a page that has been optimized via SEO for the term “buy socks online.” Using a combination of site content, structure, incoming links and other factors, Happy Socks is showing up as the #1 “organic” search term here – meaning they don’t pay anything extra to be listed in this place – unlike their listing directly above, which they are paying for via SEM (see SEM section for more information). 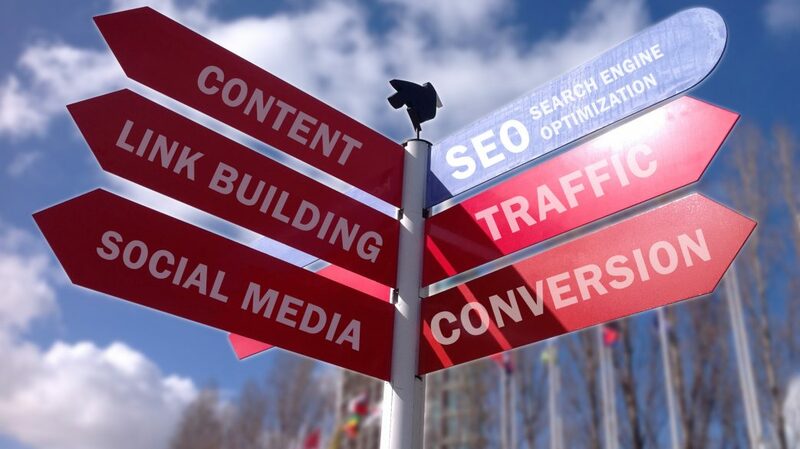 A kind of sibling of SEO, SEM is also focused on the search engine portion of digital marketing. The difference though is that it is focused entirely on paying for placement inside search engines. If you’ve ever seen a listing with the little icon saying “Ad” next to it in search results, that’s an SEM advertisement. To show up in this location via SEM, the advertiser puts together an ad including a headline, destination web page and some copy within Google’s AdWords system. They then choose what search terms they would like to show up on, and how much they are willing to bid to show up there. The system works mostly in an auction format, meaning the highest bidder tends to show up at the #1 position (although Google also looks at other factors such as relevance and user intent to ensure these spaces aren’t filled with spam). An example of a paid search ad, listed here through a practice called SEM (also commonly referred to as PPC or Pay-Per-Click). The advertiser builds their ad, tells Google what “search terms” they want to show up for and the maximum amount of money they will pay for every click – and every time someone clicks, the advertiser pays a small fee. You can differentiate paid listings from “natural” or “organic” listings by the little “Ad” icon. The last major way to optimize your digital marketing for search engines is through Product Listing Ads (PLAs). When you’re searching on Google, Bing or even Amazon you’ll often see listings for products to purchase. These usually include an image of the product, a title for the product, a short description, price and the name of the store. But what you probably didn’t know is that these are almost exclusively there through paid placement. In fact, the only way to show up on Google’s “shopping” section now is to pay to be there. This includes putting together a feed of your products and bidding for placement in their shopping results, much like you would for more standard SEM bids. In addition to just showing up though, PLAs have to other pretty major benefits. One is that a listing for a product that has a price and a clear indication that you are going somewhere to buy a product means people clicking on these links tend to have a much higher conversion rate than those clicking on other search links. The other is that this is the only way to get your product images to show up on Google’s otherwise text-heavy search results – giving them much higher click through rates. Example of Google Product Listing Ads (PLAs) for the term “buy socks online.” These socks show up here because the advertisers have built a product feed to supply to the Google Merchant Center and have entered bids to pay for their products to show up for this search term. When asking “what is digital marketing?” one thing to keep in mind is that at its core, digital marketing is just another form of marketing. And as another form for marketing, this means one of the most effective ways to market is by simply sending a marketing message to a potential customer. When it comes to digital marketing, this includes a variety of different methods, but the underlying concept is the same: the message is being sent to the customer into some variation of an inbox, versus having them find the message (usually through search marketing) or having is show up in front of them while they’re doing something else (see display advertising below). Simply put, the marketer is creating a marketing message and sending it to someone for them to consume (and hopefully act on). The oldest, and most widely-recognized method of “push” digital marketing is e-mail marketing. Ever get prompted to sign up for special offers or get a promotion in your e-mail inbox telling you about a product, sale or special offer? Those are examples of e-mail marketing. That said, e-mail marketing has become much more nuanced since it first came around and is often much more than a simple call-to-action or prompt to buy. Many more advanced marketers are now using segmentation and data analysis to make their email a much smarter method of communicating than is generally available through other channels, in particular because marketers can often tie specific demographic information to a customer’s e-mail address. This means e-mail is very often used for personalized offers and product recommendations, as well as for what is referred to as “lifecycle” messaging – meaning that marketers can different triggers or events in a customer’s lifecycle to send them different messages that are appopriate for that specific person at that specific time. (It’s why you get a welcome e-mail when you sign up, and an “abandoned cart” e-mail when you you don’t finish checkout). A somewhat more recent phenomenon, push notifications came into vogue as the app economy took off. 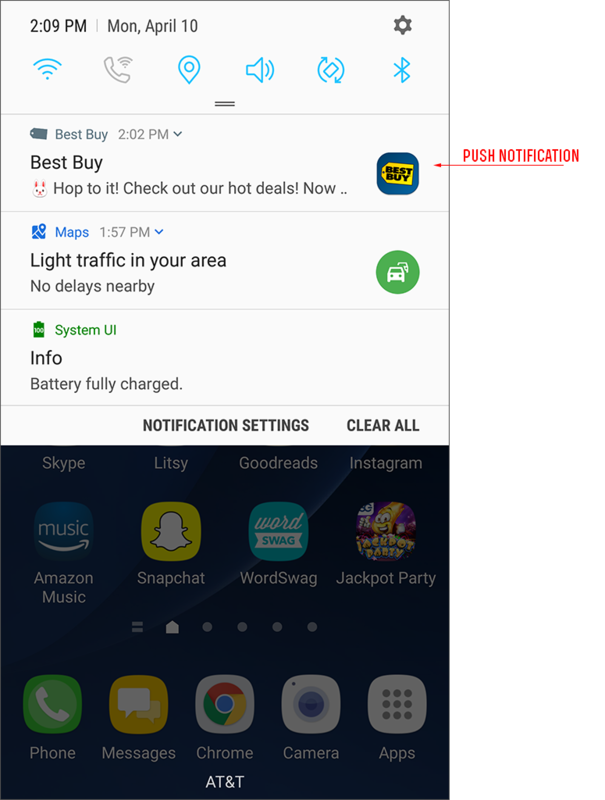 While they can be used for many different communications reasons, digital marketers use them to “push” a notification to a user about some kind of event or promotion. These have usually been tied to apps, but have recently also moved to the regular Internet – particularly through Chrome’s new push notification system. Here’s the one that most people think of first when they ask “what is digital marketing?” – display marketing (aka ads). These are methods to get your message in front of users while they are doing something else or hanging out somewhere online and you want to push your message in front of them. Basically think of any time you see an ad show up on a web page, video you’re watching or in your feed on a social media site. Those banner ads you see all over the web? Or the things that pop up before a page loads telling you about a hot new product? Those are display ads. Generally display ads are purchased through display ad networks, looking at a combination of things like user demographics, site content, etc. They’re usually the cheapest form of advertising online, but they also tend to be the least effective – due in large part to the fact that there are so many of them that most customers have learned to tune them out. (And many more have installed ad blockers to avoid them entirely). They can be effective in digital marketing though when used correctly. In particular, the low cost makes them prime opportunities for branding campaigns – meaning campaigns where you want to repeatedly show your brand / product / message to people to subconsciously make it recognizable and trustworthy, but without the explicit intention to drive a sale directly from the ad. Example of a display ad. I’m writing this article on April 10, 2017 and apparently Better Call Saul is coming back to AMC tonight. I don’t watch the show (I know, shame on me) but by buying a display ad on IMDB.com AMC’s marketing team is letting me and everyone else who goes to the site today that the show comes back tonight. Since they are using a constant influx of data to make the purchasing decisions, these ads tend to have higher direct returns – but they also can put your ads in places you don’t necessarily want to be associated with. To put it simply, digital marketing allows marketers to see customer behavior and then trigger ad displays off of this. Usually you’ll see it take the form of an ad showing you that a product you looked at is still out there waiting to be purchased, but retargeting can be used for more than that – such as for building custom audiences on Facebook. Example of a retargeting ad. I had recently been looking at mattresses from Plush Beds, and they are now displaying ads for their mattresses on other web sites I visit via programmatic retargeting ad buys. Due to the fact that customer intent to purchase is generally quite high for those who have previously viewed a product or visited your site, buying ads via retargeting is one of the most cost-effective methods of digital marketing out there (although there are sometimes arguments as to if the person would have bought anyway, even without the ad … but those have been generally proven as wrong). Tip: An important thing to remember with any kind of display advertising is that these methods of advertising are generally “intrusive” – meaning they are being presented to people who are actually looking to do something else. For example, if your ad is showing up in someone’s Facebook feed, their purpose of being in Facebook is generally to engage with friends or colleagues, not to shop – meaning that the likelihood of them being in market at that specific moment is very low. Keep this in mind when building out your digital marketing strategy. Probably the hottest form of marketing these days, content marketing is just what the name implies: creating content as a means of marketing. Unlike most other forms of marketing, however, the point of content marketing is to drive people to your brand by offering them a piece of useful content, versus the more traditional method of focusing on the product or service you are trying to sell. A good example of content marketing is a “how-to” blog or video, put together by someone who wants to position themselves as an expert in their space – ideally to drive in qualified “leads” that could then at some point be nurtured into a business relationship. Content marketing generally takes the form of educational or entertaining content, in a way tangential to the core business. Musicnotes’s Song Spotlight series is another example of this, in that it’s used to help drive awareness of Musicnotes as a brand, as well as an expert in the field of making music – but mostly through entertaining and educational video content that’s related to Musicnotes.com, but not specifically tied to or selling their core product (sheet music). One area people sometimes miss when they ask “what is digital marketing?” is that of affiliate and influencer marketing. This is due in large part to the more hidden nature of this type of marketing – and the fact that it is hardly exclusive to digital marketing – though it has found its own place in the digital realm due to the ease of creating your own web site and the proliferation of social media. Affiliate marketing is a method in which a brand or company works with third-parties to promote their products and services, giving the “promoter” a portion of all sales they generate. Basically someone signs up as an affiliate and then they use special links to promote products from another company – and every time someone clicks and buys that “affiliate” gets a portion of a sale. For example, I’m an Amazon affiliate. If you click this link and you go buy something from Amazon, I’ll get something like 4% of the sale price paid to me. It’s a particularly effective approach to digital marketing because it’s easy to track, and almost exclusively performance-based. Meaning there’s no cost (other than platform costs) for the ads your affiliates run. How they promote and how much they spend on the promotion is up to them. It’s kind of like having your own sales team. A cousin of affiliate marketing, influencer marketing is again using a third party to promote your product or service. The difference here is that it is rarely performance-based, but is instead done through either paid placement or really good public relations. Think of it as the modern equivalent of the celebrity endorsement – except that these days anyone can be a celebrity, as long as they have people following them online. If those people are “influenced” by the person you have promoting, mentioning, reviewing, unboxing or using your product, that person is an influencer. Given that people are considerably more likely to purchase something based on someone else’s opinion than that of a marketer, and so many new opportunities are out there from people looking for ways to monetize their online following, influencer marketing is pretty hot right now. Pretty much the epitome of influencer marketing, Kim Kardashian capitalizes big-time from her social media following by promoting various companies. While this may not look like an ad, it absolutely is – and airbnb thrives from this sort of influencer marketing. No answer to “what is digital marketing?” would be complete without talking about social media marketing. But the fact is, social media marketing isn’t so much a form of digital marketing so much as it is a channel that can be used to deliver a variety of the methods discussed earlier – in particular content marketing, influencer marketing and display marketing. But other than the “marketing” part of social media marketing there’s also a very important aspect that is easily overlooked from a basic “digital marketing” perspective, and that’s brand image. Social media can be extraordinarily useful in promoting a brand image and identity – as it’s the most open and visible way in which to participate in a two-way communication with your customers, potential customers and even your detractors. If you really want to get an idea how to do social media marketing right, go read Gary Vaynerchuck’s “Jab, Jab, Jab, Right Hook” (and yes, that link is one of those “affiliate marketing” links). And last of all, one answer to “what is digital marketing?” that you won’t find many other traditional digital marketers say, but that is in my opinion one of the most important aspects of digital marketing: customer experience and design. Up until now, all the other examples of digital marketing have focused on ways to get your message in front of people and drive them to your store/product/service … but once they get there, marketers often feel their work is complete. This is absolutely not true. In today’s marketing world, everything ties back to data and the customer experience. This means that every interaction with your brand is part of marketing – not just the promotions that drive them there in the first place. This means that if you’re a digital marketer for a brand doing any business at all online (and every brand should be doing at least some business online by this point), your marketing also includes a focus on key experience areas including onsite merchandising, price structure, return and warranty policies, promotions, user pathing analysis, A/B testing and conversion rate optimization, color schemes, brand guidelines and anything else you can think of that a customer sees or experiences as part of their interaction with your brand or product. Digital marketing is about much more than advertising. It’s about your customer relationship with your brand. So what is digital marketing? As you can see, it’s a lot of things – but one thing it is not is a series of disparate islands. Even though there are many different ways to approach digital marketing, a strong digital marketing approach incorporates many, if not all, of the digital marketing methods listed above. But it doesn’t just use them all. It uses each one in a strategy that ties them all together. Social media marketing feeds off content marketing which can build lead generation which can grow your e-mail marketing list. Your paid search efforts can build brand recognition so that next time an affiliate shows an ad for your site the user clicks through because they’ve seen it previously … but they don’t buy just yet, and instead they get a retargeting ad which drives your purchase. So again, what is digital marketing? It’s using a combination of digital marketing methods together to build one strong strategy. And if you’re doing it right it doesn’t end at digital – but instead includes the offline world as well, in what is called “omnichannel marketing.” But that’s a topic for another time. That’s the whole story on digital marketing!